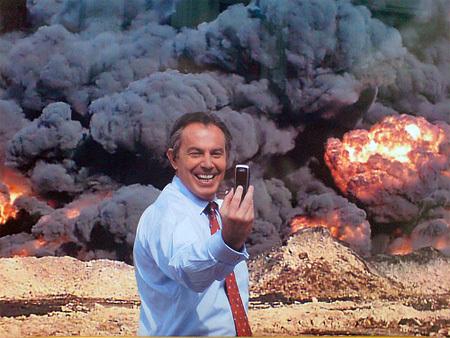 This is in response to my previous post, ‘Tony Blair: A Modern Day Hero’, in which I pooped on Mr Blair’s PR campaign that paints him and his deeds as good as gold, while he sponges off public money to peddle an agenda that conveniently makes him rich. In requiring the proletariat to carry out such a system, and thereby to march straightway into the social New Jerusalem, it but requires in reality, that the proletariat should remain within the bounds of existing society, but should cast away all its hateful ideas concerning the bourgeoisie. By changes in the material conditions of existence, this form of Socialism, however, by no means understands abolition of the bourgeois relations of production, an abolition that can be affected only by a revolution, but administrative reforms, based on the continued existence of these relations; reforms, therefore, that in no respect affect the relations between capital and labour, but, at the best, lessen the cost, and simplify the administrative work, of bourgeois government. So basically, you are cordially invited to remain where you are in society under the promise that these rich folk will make those rich folk share their wealth with you. You aren’t entitled to your equal share of the nations wealth, and you’ve relinquished numerous freedoms that could have given you the capacity to produce wealth for yourself. Now big government is in control, and is swallowing the responsibilities of taking care of everybody elses affairs, presenting the front of a humanitarian mission. Conveniently this really creates extra work to keep the political class minted for a lifetime. And noone dare speak against it, because that would be inhumane and unequalitable. But they keep the top buck, while thousands of ordinary people, the very people that the social biourgeois claim to help, come under ever tighter pressure to have a comfortable life, never mind accruing wealth. What is commonly referred to today as socialism and communism has little connection or unanimity to the manifesto written by Marx and Engels. Think for yourself, discover what the political class’ real agenda is.